On Tuesday, NHLPA Goals & Dreams celebrated the fourth stop on its 15th anniversary tour in Toronto at the site of the old Maple Leaf Gardens. On Tuesday, January 6th, the NHLPA Goals & Dreams (G&D) fund continued its multi-city 15th anniversary tour in Toronto, Ontario where more than 30 children from Eastern Commerce Collegiate Institute and the Hockey Education Reaching Out Society (HEROS) spent an afternoon learning about nutrition and playing hockey with NHL players David Booth, Jake Gardiner, Morgan Rielly, and Daniel Winnik. The event kicked off at the Mattamy Athletic Centre – site of the old Maple Leaf Gardens – where Toronto Maple Leafs players David Booth and Daniel Winnik joined the children from Eastern Commerce and HEROS at the Loblaws Cooking School for a nutrition class where the kids learned about the importance of fueling their bodies with the right foods to help in areas such as athletic performance. Both Winnik and Booth each spoke to the group about the foods they eat - and don’t eat - as NHL players, and answered many questions the kids had about healthy eating. Following the nutrition lesson, the children headed upstairs for a meet and greet with Booth and Winnik, as well as Morgan Rielly and Jake Gardiner. The players sat down in a lounge overlooking the rink at the Mattamy Athletic Centre, giving the kids the opportunity to chat with their hockey heroes, pose for photos with them, and collect autographs. Inside the lounge, NHLPA Divisional Player Representative and former NHL player, Rob Zamuner, was on hand to join the players in an announcement of a NHLPA Goals & Dreams donation of $25,000 worth of hockey equipment in the form of 60 full sets of equipment, which will be divided between Eastern Commerce Collegiate Institute (10 sets), HEROS (25 sets), and Rams in Training (25 sets). Group photo ft. kids from HEROS and Eastern Commerce Collegiate Institute during our @nhlpa_official #GD15 equipment donation at the Mattamy Athletic Centre. Toronto marks the fourth stop on the G&D 15 tour. Goals & Dreams, the largest grassroots hockey assistance program in the world, has contributed over $22 million to grassroots hockey programs and given more than 70,000 children the opportunity to play hockey in 32 countries since being established in 1999. It has worked with many hockey assistance programs in the past, and has a longstanding relationship with Eastern Commerce Collegiate Institute, HEROS, and Rams in Training, which makes Toronto a perfect stop for the anniversary tour. The Eastern Commerce Collegiate Institute hockey program is run by Nolan and a group of fellow volunteers, and aims to help introduce students at the inner-city school to the game of hockey. Some students in the program are new to the country, some students are simply new to hockey, but through the program each student is given an opportunity they otherwise wouldn’t have to play the game. The mission of HEROS is to use the game of ice hockey to teach life-skills and empower at risk youth. Founded in Vancouver, Canada in 2000, HEROS provides free ice hockey programming for at risk youth, offering a safe and stable environment for young people to succeed, experiment and connect. The Rams in Training program provides youth in the community an opportunity to learn valuable life skills through sport. Emphasis is placed on nutrition, leadership, commitment and determination. Sessions are led by Ryerson student-athlete mentors and are held at the Mattamy Athletic Centre. After the donation, the children laced up their skates for a Goals & Dreams Cup friendly hockey game. Honourary coaches Rielly and Garnider took their places at their respective benches and helped guide their teams for the match-up. 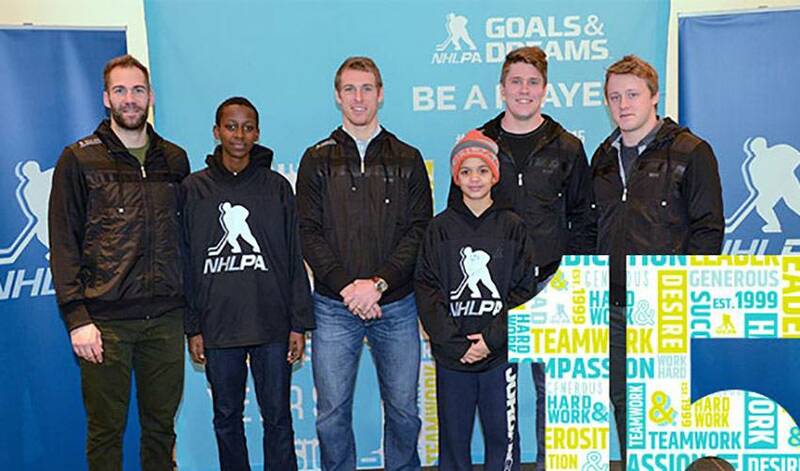 The next stop on the NHLPA Goals & Dreams Anniversary tour schedule is Los Angeles, California, in early 2015. If you’d like to get involved with G&D, fans have the opportunity to bid on game-worn jerseys by NHL players through a series of online auctions held in conjunction with each of the G&D 15th anniversary tour stops. In the Toronto phase of the auction, which is now open to bidding a Phil Kessel 2012 NHL All-Star game-worn jersey, a James van Riemsdyk 2014 Sochi Winter Olympics game-worn USA jersey, and a Mats Sundin 2001 All-Star game-worn jersey. Proceeds from this auction phase will be donated back to Rams in Training, Eastern Commerce Collegiate Institute, and Hockey Education Reaching Out Society, through the G&D fund.